Nicholas Willmott: To add to that said by Andrew Brown, its not so much the format of the 4G signal that has the potential to cause problems but the RF power level it will represent in a receiving aerial compared to that of DTT mux signals being received from muxes that operate round the top end of the band, something that could have a serious affect for viewers in locations where signal levels that their TV's or boxes are operating on is inclined to be at the lower end of ideal for reception even although the quality of the signal is reasonably stable, a situation which unfortunately affects a multitude of viewers even although they may not be aware of this fact. Although I personally feel that this issue is up to a point being over hyped and which is responsible for a great deal of anguish being caused amongst viewers, however I also feel that's its undeniable that viewers located anywhere within about 500 yards or so from one of these base stations are very likely to suffer from varying degrees of problems caused by the swamping effect that the powerful signal will have on the tuners used in their TV's or boxes, and its by no means guaranteed that a relatively cheap filter will cure the problem although I believe that a somewhat more expensive and technically superior item is being developed for communal aerial use. That said though, the whole issue of the potential interference caused by 4G is determined by a number of variables such as whether or not the 4G base station is located anywhere near to that of the direction which DTT transmitter is being received on, plus the fact that some TV's or boxes are liable to be affected much more than others simply because some tuners are technically superior to others, and so there is an element of hit and miss about the whole situation making it an issue of "wait and see", as in most situations where RF signal issues are concerned nothing is really exact about what will happen. By the way, although a standard DVB-T tuner will appear not to see a DVB-T2 signal during a retune the actual RF side of the tuner still does, whereas not the decoding side of the circuitry hence the sometimes "no signal" indication seen on some devices if a manual tune has been carried out on the DVB-T2 mux. Thank you for your explanation Andrew Brown and jb38. Worryingly the Bath relay (although group A and not itself affected), still has to pick up the signals for D3&4 on C54 and HD on C58 from Mendip to relay them to Bath on C28 and C22 respectively. So could 4G interference prevent the Bath relay picking them up from Mendip to rebroadcast them? What kind of filters will they need to use at the Bath relay to get around the problem? The question remains, do they really need to use the ex-TV UHF channels 61-69 for 4G? Why not replace the rest of the 1710-1880 MHz 2G, and all the 880-960MHz 2G with 4G? Surely 2G is obsolete now. Why not just switch off the 1900-2170 MHz 3G in a stroke and replace it with 4G? 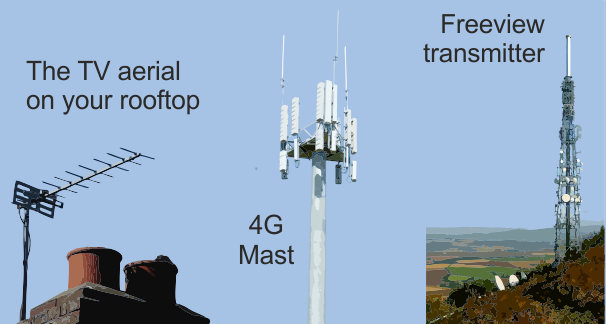 Why not switch off the MW radio band (540-1600 kHz) and replace it with 4G? I don't really see the need for MW radio any more, surely hardly anyone listens to it these days. Nicholas Willmott: Just to nip in here and the question about relay picking up the off-air signals. As there are a small number of such sites - plus another 55-ish that are used for "cable head-ends" are know and will be dealt with specially. MW can't be used for LTE, it would not be able to provide any useful bitrate. jb38: From what I have seen from the public statements by at800, it would appear that the proximity to a mobile phone mast (1.5km) is the primary effect on "overload" interference. The second effect is that masthead and domestic (ie, unshielded) distribution amplifiers are problematic. Another point, which was in the first lot of the Ofcom reports is that Virgin Media Boxes CAN be effected. Briantist: Mendip alone has 61 relays. Only two are fibre optic fed from Mendip, the rest are over-the-air fed for rebroadcasting to their local areas. Other group C/D transmitters such as Winter Hill have relays which are over-the-air fed. So altogether, won't there be an awful lot of relays to worry about, anything but a small number? Any idea how many relays in total might need some sort of protection from 4G interference. Why would MW not provide any useful bitrate for LTE? Please explain the problem more fully. Nicholas Willmott: It's a very small number compared to the millions of homes in the UK with off-air reception. And they are all owned by one company (Arqiva). The bitrate that can be achieved by digital communications is a function of the bandwidth aviliable. LTE is 5MHz up and 5MHz down in the UHF band. Remember, the diagram at the top of the page is logarithmic. Thanks Briantist. So basically 4G LTE uses channels 5 MHz wide (thus collectively they won't directly map to the traditional UHF TV channels 61 to 69 which I've been led to believe are 8 MHz wide each). Now that DAB is increasing in popularity, could they turn of FM radio (88 to 108 MHz) and use that for 4G LTE - would the resulting clear 20 MHz bandwidth be enough? Nicholas Willmott: It's 5MHz per operator per direction (one up, one down), with O2 having two and Vodafone having two allocations, with 3 and T-Mobile having one each. The problem with FM radio is there would be no room for the 10MHz of "duplexing gap" between the upload and download allocations. Briantist: Yes, quite so! and I do appreciate that these statements have indeed been made, but though what always slightly niggles me when reading these sort of reports is that they are frequently seen made in a somewhat black and white fashion (my interpretation anyway!) as though what has been said is absolute fact, whereas anyone involved in dealing with RF equipment and its potential for causing possible interference problems knows full well that in most cases variables will always exist, and so I always take statements made in a categorical fashion with the proverbial pinch of salt. 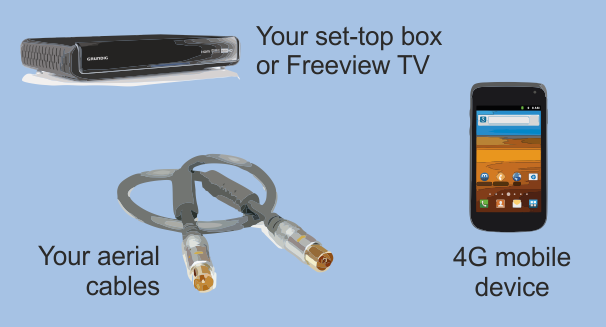 Of course the variables I refer to in this type of situation are mainly concerned with a viewers installation and the multiplex channel range being received by the viewer as well as the level that the Freeview signal is being received at, and with this also being coupled to all aspects concerning the installation including the type (brand) of equipment they are using, the tuners used in some brands (not necessarily cheap either) being most intolerant to sensing an excessive level of RF on the input. However, what actually happens once that the 4G transmitters are up and running will be of great interest to me as I can envisage a situation developing where a viewer in one household is relatively unaffected whereas their neighbours reception next door is being devastated, and its in cases involving the latter that the effectiveness (or lack of) in using these cheap filters will soon be revealed. P.S: Will also keep in mind what you have said regarding Virgin media boxes being mentioned, as I was unaware of that having been reported. Briantist: Just a little addition to that having been said earlier on, insomuch that I also accept that 4G does have more of a potential to interfere with DTT transmissions by the fact of the radiating elements used by its aerial system being much lower down, and indeed in many cases not being that terribly far above that of the average height of a domestic roof mounted aerial, this meaning that the main beam from the 4G aerial will have maximum impact on a DTT receiving aerial. This of course making the situation worse than say for a viewer residing up to about a mile or so away from a relatively high powered DTT transmitter mast and where the main beam from its aerial is passing overhead.